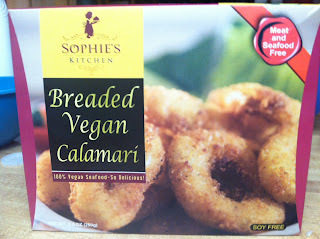 At a recent expedition to Whole Foods with my wonderful husband, I happened upon this vegan calamari. I was both intrigued and excited. 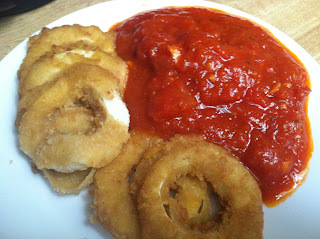 There are two meats that I have not found a good substitution for – calamari and buffalo. Thinking that I perhaps found at least one of those, I spent my $5.99 + tax on a box and rushed home with it. I prepared it according to the directions on the package, (using the oven, not the microwave) and used some of my favorite marinara sauce for dipping purposes. I was very excited, and then I bit in. With calamari, you want it to be a little rubbery, but I had to check to see if I was actually eating rubber bands. It was that bad. After several chews, I managed to get the first ring swallowed, and it hit my stomach with the velocity of a cannon ball shot at maximum speed. I thought the first one was a fluke, so I kept going. Each and every ring was a new revelation in gastronomic horror. By the time I was done with one serving, I felt like I had swallowed every pebbles of gravel. I didn’t want to waste the rest, so I ended up finishing off the rest of the box, but never again. Jason later said that it was a repackaged Asian brand, or he was reasonably sure it was. I don’t know what it was other than A: bad and B: traumatic. I also know what else it is. It is never coming into my house again. Save yourself this horror and stay away from Sophie’s Kitchen Vegan Calamari.